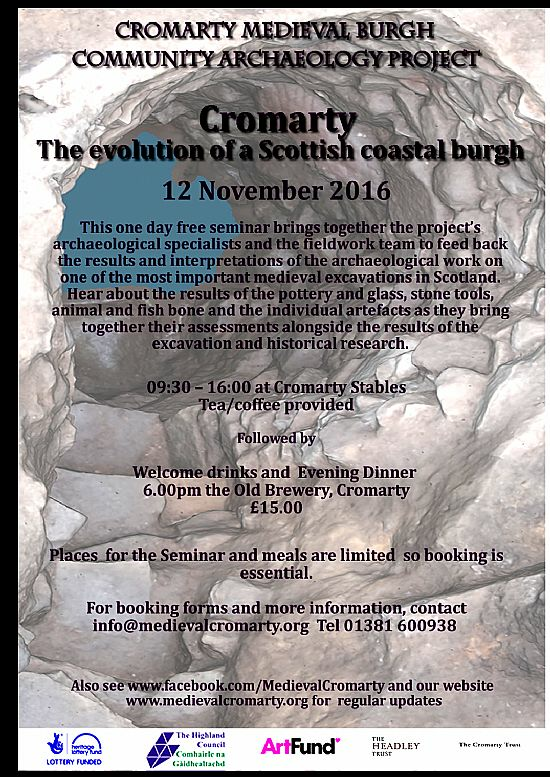 The Cromarty dig committee has organised a FREE seminar for the public to hear about the results of an amazing 4 years of digging on the Cromarty Medieval Burgh dig site! The project directors will be joined by local historian David Alston, and the team of artefact specialists, Derek Hall and George Haggarty (ceramics), Gemman Cruickshanks (small finds, National Museums Scotland), Ann Clarke (stone), Robin Murdoch (glass), Triin Aadli (animal bone, University of Edinburgh) to present a comprehensive summary of the interpretation. The committee will be providing tea/coffee during the seminar. Lunch will be provided for a £5 fee in the Old Brewery and a fantastic evening meal with wine and local beer (£15) will be held following the seminar at 6pm in the Old Brewery, Cromarty. The event is open to all of the public, but spaces are limited, so booking is essential. Limited accommodation is available at the Old Brewery and there are many accommodation venues available in the town. Contact info@medievalcromarty.org for a booking form!